Why do succulents change color? What does light stress look like in succulents? How can I make my succulents more colorful? Which varieties tolerate full sun? Temperature and water can affect color, but one of the most influential factors is the amount of sunlight the succulent receives. 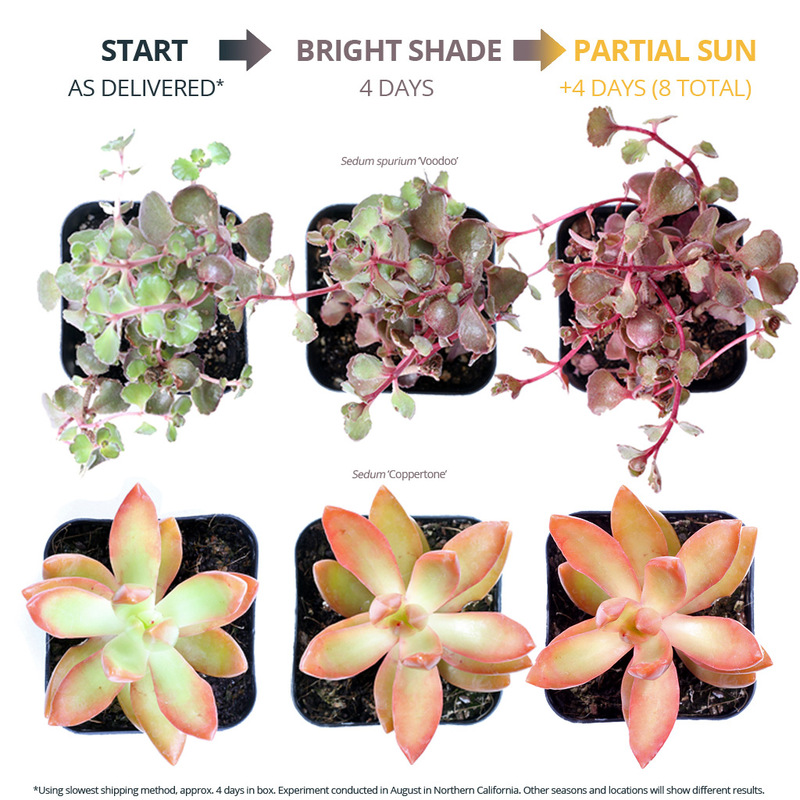 Moderate light stress can bring out beautiful shades, but a succulent well outside of its preferred light conditions for a long period of time can look sickly and eventually die. Most light problems can be completely fixed if caught early, but the initial signs of both too much and too little light can be subtle. To help you recognize them, we conducted an experiment and put a variety of succulents in two extreme light conditions: full sun and total darkness. We do not recommend trying this with your own succulents. 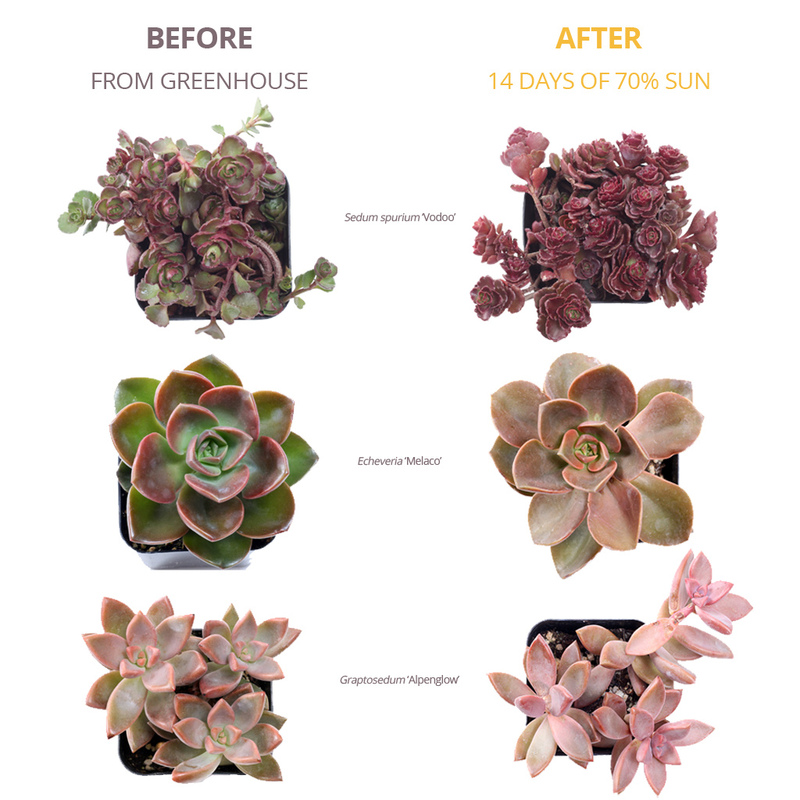 The results show some severely maltreated plants, but they can help you identify a succulent that is in the wrong light environment. What does light stress look like? 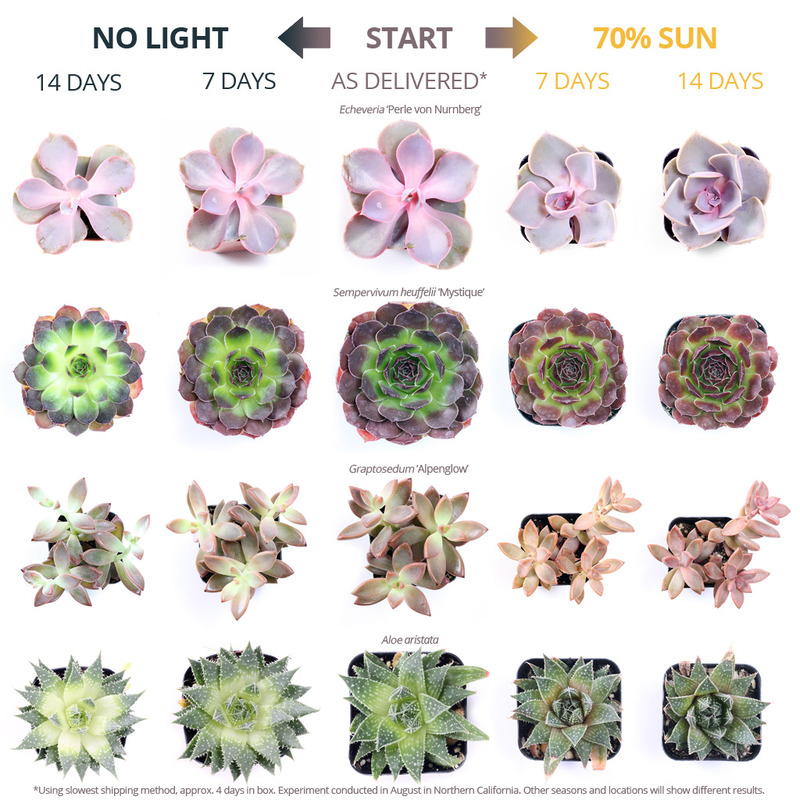 In the first phase of this test, we put two sets of a variety of succulents under a dark cover for four days to simulate shipment in a dark box. After four days without sunlight, one set was left under the cover with water and airflow but no light. We moved the other set out of the box to a location that received sun all day long. The thick haze of smoke from California’s extensive wildfires made for light conditions closer to 70% sun than true "full sun", but you can still see drastic responses in the spectrum of results below. On the left side of the graphic you can see how dramatically the plants kept in the dark changed over the course of two weeks. Fading and greening progressed from the center of each plant outward along the leaves and the rosettes opened wide and flat in search of sunlight. To the right, you can see the plants that went from a dark box directly into bright sunlight. The colors brightened and shifted from green to red tones. Rosettes that had opened wide began to tighten again in order to protect themselves. As time went on, some spots showed the scaly, crispy sunburns typical of succulents left in too much sun. As damaged as some of these succulents look, all is not lost! Fixing light-related problems is as simple as relocating your succulents. The key to a successful change in light conditions is time. The succulents in the experiment above moved directly between extreme light conditions and suffered greatly for it. Whether they’re showing signs of too little or too much light, succulents can recover bright colors if given 1-2 weeks to gradually transition into the right amount of light. The more extreme the change in light levels, the more time a succulent will need to transition. Take a look at how we brightened up some faded succulents. Bonus tip: Added sunlight not giving you as much color as you think your succulent can display? Try cutting back on water or leaving the plant out in the cold (keep soft succulents above freezing). Just like light stress, water and temperature stress can also induce a flush of pigments. As always, pay attention to your succulent so that it isn't pushed from stress to death by too long a drought or an extended period below its minimum cold hardiness. Even though our tests in full sun and total darkness were quite extreme, the results do show certain varieties that can tolerate low-light or bright-sun remarkably well. 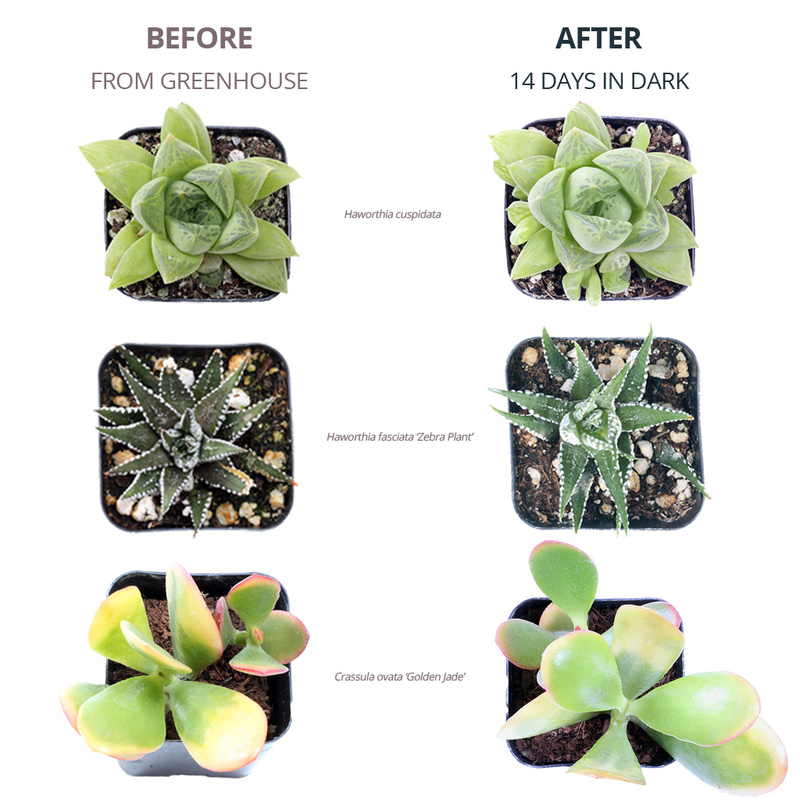 You can find specific preferred light conditions for over 650 types of succulents listed at Mountain Crest Gardens, but there are also some general patterns explained below as to which types can handle low-light and which are happiest in the sun. After cacti, Sedum are the succulents best known for tolerating full sun. Sun-loving succulents tend to be shades of pink, red, or purple and their pigments become more vibrant when they’re exposed to more sunlight, as seen in the varieties pictured below. Astoundingly, some of our experimental succulents survived two weeks of total darkness fairly well. The three cultivars pictured below show very slight signs of the fading and stretching seen in other varieties left in too little light (more about "etiolation"). Varieties that can tolerate low, indoor light conditions tend to be green because they have high chlorophyll content, which helps them absorb any available sunlight. Putting the right succulent in the right location will save you endless troubleshooting, so refer to the "Recommended Light Conditions" listed for each cultivar at Mountain Crest Gardens. Pay attention to your succulents so that you can catch signs of fading or sunburn early. Succulents can fully recover from most light problems if given 1-2 weeks to very gradually transition into the right amount of light. We hope this experiment helped "shed light" on the phenomenon of color-changing succulents. Happy growing and feel free to reach out through our Contact Page if you have any questions.